Truscott Boats. Did I Mention I Faild History Class. First thing I found was that they were not a small company by any means. They started in the early 1900’s in St Joseph, Michigan. It was the towns largest employer. and cranked out 600 boats a year. They had sales offices in most US cities. and offices from Chicago and China. They also were the first company to hire women at the start of World War Two. After the war they kept building boats.. But maybe not the most exciting boats, or bad salesmen.. What ever the reason, sales were not good, and they closed doors in 1948. That’s it. I don’t even have the name of the Trucateer’s owner, it was over in the parking lot with no name tag on it. Oh boy, Louis Rhetti my 6th grade teacher would give me the big F on this one. So I invite any Truscott geek out there to chime in. I am open to any sort of history. Like, Walt Disney worked there as a kid and when it came time to name the kids for his TV show…. Winter Storage - Just In Time For Spring! Ok We Are A Bit Late. Honey, Guess What Followed Me Home? Honey? Honey? It's the same design as a 16' Gar Wood Ensign. 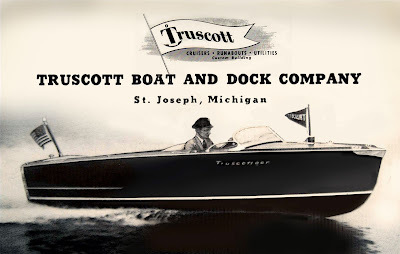 When GW went belly-up in '47, a dude (Ed Hancock) went to become the general manager at Truscott boat and took the building jigs with him to Truscott. I went back in my record to see if I could find the owners name for you. Unfortunatly this boat was a last minute entry and the info was never entered into the database. I'll talk to some of the other guys and see what I can come up with. Truscott got gobbled up into National Boat and Engine Company in 1910. The latter was an amalgamation of numerous boat manufacturers and engine builders. It went bust in less than two years. In 1912 some of the bankrupt entities got toegther and formed Racine-Truscott-Shell Lake Boat Co. This entity only lasted a couple of years. The three firms split and went their own way. Maybe they were ahead of their times in their idea of consolidaiton??? 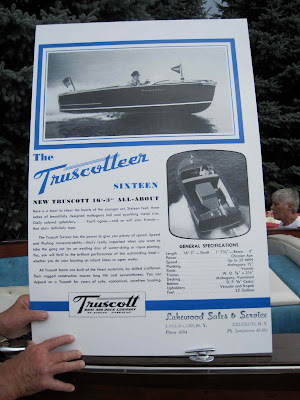 Hey its great that everyone noticed the 1948 Truscott boat tucked in the back of the boat show. It will be at the McCormick Place Boat and RV show in Chicago from January 13th through January 17th, 2010 http://www.chicagoboatshow.com/. 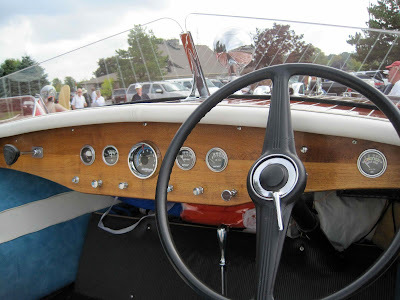 There will be 20 other antique and classic wood boats and a bunch of restored outboards as well. 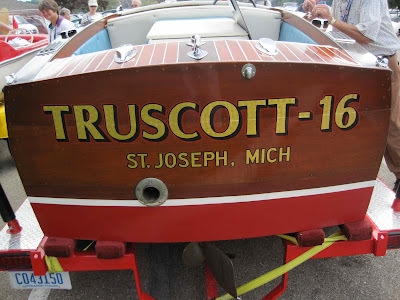 I thought that my Truscott was a rehashed Gar Wood until a local St. Joseph Michigan resident approached me and said his dad was the architect of the boat. He searched for and produced the original blueprints for the 16 footer signed by his father in September of 1947 for the 1948 production run. This boat was completed in May of 1948 and by October the company was bankrupt. Most of its life it spent in small lakes in middle Wisconsin and from documents that I have i believe that it was sold out of a truscott dealer in Green Bay WI in 1948. I have a metal plate for your boat. I think it’s copper and it gives all the details with boat price. In the early 60's, my father restored a 24' Truscott, I'm not sure of the year, perhaps a 1948. It had a six cylinder "Chrysler New Marine" engine – I think about 90 hp. It looked most closely like the second one down the right hand column in the above sales lit. Dry dry rot got the best of it after Dad sold it and it is no more…a most unfortunate loss. But I have many grand memories of charging up and down the St Joseph River (he moored it at what is now Eagle Pointe Marina)and slamming across waves in Lake Michigan. We posted our 1948 24' Triuscott on Craigslist this past week. Good shape, needs some work but could run right now if needed. Owner is ready for someone to take over maintenence, give her a good home and keep the histoey alive. Has been a grat boat for us for he last 40 years. Is it still for sale ? What Model ? Price ? Pictures ? $500 Coupon Bond-Does it have any value? Can you e-mail us a scan or photo of the coupon, with any info you have on it and we can try to do a story to ask that interesting question. I never knew they made such beautiful boats, my grandfather worked there during the war years & they built PT boats. I still have his photo ID. We have a 1946 Truscott “Fisherman”, 24 ft., in need of a good home. Photos on request. Been in our family for 40 years, but we have one too many projects going on. We had a 24 foot Truscott Express when I was a kid. Pretty fast boat with a Chrysler “Crown”. I would love to find one somewhere and rebuild it. I keep looking. Where are you located? I would love to look at it. 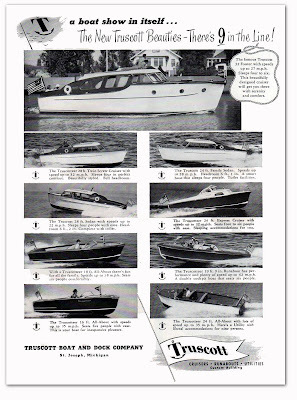 There was an informative article in “Michigan History” magazine, July/August, 2006, about the Truscott Boat Mfg. Co. Apparently it was started by Thomas Truscott and three of his sons in the mid 1800’s. The Fort Miami Heritage Society in St. Joseph, Mich., might have more information. I would very much like to hear from anyone with personal knowledge of the last few years the company was in business, as my father worked there during the war up until it went out of business. He always said it was the best job he ever had. This is my 16 foot Truscott. I have a bunch of info, etc. that I have been collecting for years on the boats and the factory. I am in St. Joseph MI. Anyone who has parts, brochures, info, stories, data, or boats for sale etc. I am trying to collect and get back to St. Joe. if at all possible. I have pics, etc. Contact me at [email protected] do you have the utility? Hello. I’m searching for Truscott boat plans and drawings from approximately 1900. Do you have any suggestions for this search? I don’t need originals. 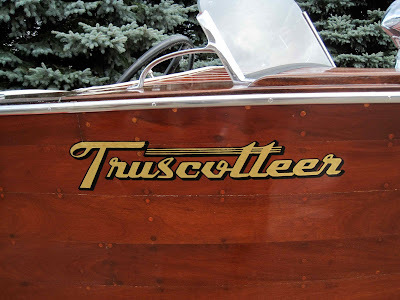 Does anyone have pics of a 18’6″ Truscott 1947 Utility? I am lookin to restoring one. 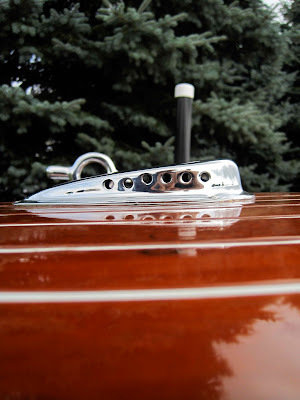 I don’t have any info on a 16 footer, but discussions about Truscotts are so few and far between that I’d like to add to the thread with a few photos of my 24 foot Express Cruiser, because too few are available. Certainly is a strong resemblance to Gar Wood designs, although I’ve been chastised for mentioning. The boat was powered with an Ace when I took over, but it had a cracked block and raw water cooling which I replaced with a rebuilt Crown and fresh-water cooling. Portions of the cabin topsides have also been replaced, but she’s basically stock. Anyways, cheers to keeping them afloat. One more photo that’s worth sharing to anyone interested in Truscott’s. Once upon a time they were cover girls. Well this is interesting. Just discovered today that I have a photo of a 1913 (commissioned) 76 foot Truscott (was the full name Truscott Boat and Auto Supply?) which had Sterling engines installed. He must have trusted them after the events he had with his Mildred G. II, which had Sterling engines. That story is at- https://prentz2.wordpress.com/mr-gray-takes-hugh-dolan-on-a-boat-ride/ This new yacht would be the Mildred G. III. My grandfather worked for Edward Gray, Henry Ford’s Chief Engineer from 1906 to 1919 then again in 1937-39. I’ll post the article about the building of this yacht below. Truscott builds Edward Gray’s Mildred G. III, see the top left column. The story also builds around Sterling engines. And the answer to my own question? Yes, in 1906 it became Truscott Boat and Auto Supply- for how long? Who knows! I’m restoring a 1917 26′ Truscott launch and would like to have the Truscott Co. flag on it. Does anybody know what they looked like, and where to find one? In May 2017 you posted that you have a metal plate for a Truscott. Would love to have it for the boat!! !